Sent this to my in laws for Christmas and they loved it. Will send the bigger package next time and to other people for other occasions. Advantages: Great variety of choices of flavors. My out of state family truly enjoyed the Pecan Tin 28 oz as a Christmas gifts. They represented Texas and her wonderful products well. Sent to my sister for Christmas since she loves Pecans and I wanted something Texan. She loved it and so did her two year old. 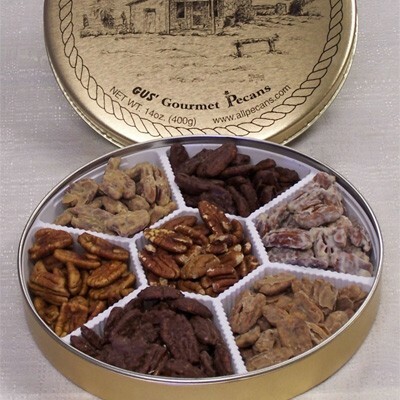 I ordered the pecan tin for a friend of mine who is studying for the priesthood to encourage him. He LOVED the product and I don't think he could bring himself to even share much of it. Thank you for making such a delicious item available. Bought these for my husband and he absolutely loved them-wouldn’t share! I sent these as a present to friends in Boston. It was easy to do. They enjoyed them. It was a gift. Friends told me it was great- they enjoyed it. So much better than the other guys!!! This is the best seasoning salt ever. I discovered it several years ago and haven't been able to find it again locally so I order it online. I think I just might have purchased a lifetime supply.